To be or not to be….. – William Shakespeare, Hamlet. Leibniz the famous German mathematician ( also the co-discoverer of calculus with Newton) was said to have a spiritual dimension to his relationship with numbers. he invented the binary (base 2) system which is the basis of computers and indeed the basis of all our modern telecommunication gadgets. 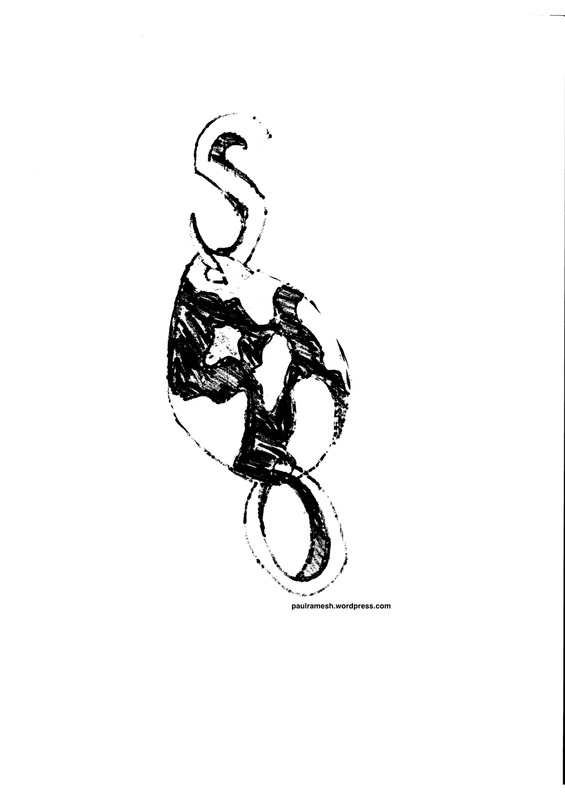 he said that it represented the creation out of nothing (creatio ex nihilo). The ancient Chinese text i Ching has base 2 based hexagrams and the ancient Indian mathematician Pingala used base 2 to lay down the rules of sanskrit poetry construction. What does base 2 mean? We are familiar with using numbers from 1-9 (base 10 system) – no doubt because we can relate to it as it is the same as the number of fingers we posses. Just as we have no new number to represent anything beyond 9. We represent 10 by reverting to putting 0 in the ones place and 1 in the tens place. Another way of describing the base 10 system is to say – units as 10 power 0, tens as 10 power 1, and hundreds as 10 power 3. All our computing devices, computers, smartphones etc use the base 2 system. Computers are built of many circuits using semiconductors – information supplied to it takes the form of current flows (1) or does not flow (0)(usually a higher voltage and a lower voltage) that can be stored and retrieved. At its very heart this forms the basis of all computing of the modern era. the advantage is that even when distortions of the signal occur – ‘noise’ which can distort the information as in an analogue system the damage is limited in computers as the key information is conveyed in only one of two possible states – current on or off. Binary numbers and geometrical objects. Solid geometrical shapes can be represented using the binary system. Here is an example of representing a cube using the 1’s and 0’s. Take a cube and designate its corners as numbers 1-8. 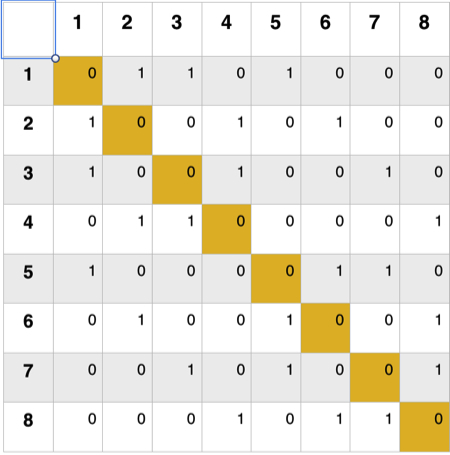 Build a matrix and if the 2 numbers are connected by a line then give number 1 – if no connection exists then give the number 0.
the numbers are a mathematical representation of a cube. Line 1 is a mirror image of line 8. The numbers above the diagonal are mirror image of the numbers below the diagonal. There are a number of mirror symmetry that becomes apparent when you view the resulting matrix. The binary code in medicine. Any event, signalling, cell death etc can in theory be regressed to a series of happens and does not happen and complex mathematical models can be made to study and understand them better. this is the field of binary biology and is being used among other areas in cancer biology to predict the behaviour of cancers and treatment outcomes. You must learn all things, both the unshaken heart of truth, and the opinions of mortals in which there is no warranty.
. William Shakespeare, Macbeth, Act 5 Scene 5. Space is in the first place a device introduced to describe the positions and movements of particles. Space is therefore literally just a storage space for information. This information is naturally associated with matter. Starting from first principles, using only space independent concepts like energy, entropy and temperature, it is shown that Newton’s laws appear naturally and practically unavoidably. Gravity is explained as an entropic force caused by a change in the amount of information associated with the positions of bodies of matter. Erik Verlinde. If you are a minimalist and wondered about what was the most basic force. that made the universe and everything in it – what would be your choice? I have come to the conclusion (for now) that it appears to be temperature (thermodynamics). To physicists this may be second nature – but for me it is was a little difficult to absorb. There are some interesting facets about temperature and another fundamental property of nature – time. Temperature is defined by a scale from hotter to colder or vice versa of one body compared to another body or to itself at a different point in time. They both (appear to) have an upper limit and a lower limit in our observable universe. The speed of light is the fastest and Planck’s time the slowest possible in our universe. Temperature has an absolute zero (0K =-273C) at which temperature the macroscopic motion of the atoms or molecules is minimum or effectively zero and a theoretical possible high – an absolute hot – Planck’s temperature – 1.41 X 10³² K. Indeed there is a temperature scale called Plancks scale that has absolute zero as O and absolute hot as 1. At this temperature the current conventional standard model of physics can no longer explain what is going on. At just a breezy 10¹ºK electrons are nearly at the speed of light, at 10³² K the energy they acquire is so large that they become extremely dense and each particle will form its own black hole – so absolute hot is the maximum temperature at which matter as we know it can exist. In the earliest phase of the Big Bang the universe did experience this temperature – since all parts of that early universe where at the same temperature no energy exchange may have been possible. Ironically the same thing happens when every part of the universe becomes the coldest possible – no energy exchange happens. So a temperature (thermodynamic) gradient has to exist for things to happen – events to happen – even for time to exist. In a completely still universe where every movement is stopped, atoms don’t move or rotate or vibrate. So there is a trade off between these 2 extremes (trade off is a feature that is central to physics, chemistry and especially biology) in our universe making time and us possible. Temperature (I use this interchangeably with thermodynamics) gradients make things possible. The phenomena of time dilation is familiar to all science fiction buffs – as you accelerate towards the speed of light – time slows down compared to a stationary observer. Not so commonly known is the Fulling-Davies-Unruh effect which postulates that if you carried a thermometer and accelerated through the vacuum it would register a higher temperature than someone who was stationary. Imagine that – your friend and you have bought cold coffee and if she stays at the coffee shop and you have accelerated through a vacuum with no outside temperature just your acceleration relative to her, it will heat up your coffee but not hers. This is due to non zero fluctuations in the ground state of a vacuum that become more pronounced to the accelerating person compared to the stationary observer to whom the temperature of the vacuum would remain at zero. So acceleration is intimately connected to time and temperature. Wavelengths of the electromagnetic waves signify energy. shorter wavelengths are associated with higher temperatures. The corollary is that as bodies approach absolute zero the wavelength approaches infinity, and as it approaches Planck’s temperature the wavelengths approach Planck’s length. There is a temperature range for functioning of our bodies. The normal is 37C. The range that humans can tolerate without immediate medical management is 35-45C, at both these extremes death soon follows without intervention. The coldest I have cooled a person for the purpose of operating on the inside of their blood vessel is 16C, a lot of support is required to bring these patients back to life. Energy has to be supplied within a range and at a given rate for it to be useful – too little, too much, too slowly or too fast are all harmful. Things can happen (work can be done) only as energy flows from higher temperature to lower temperature. As the heat of the sun pours out into the cold of space – earth harnesses that energy (actually a very small proportion of it ) to make life. As the heat of the Big Bang flows toward the cold of the final Big Freeze – our universe unfolds in its wake as a consequence. The unseen hand behind both is the same force – thermodynamics. Thermodynamics of a living cell. Life is defined as metabolism and self replication. If an entity can harness energy and use it to construct itself and self replicate it is alive. Irrespective of which came first they both are manifestations of energy transfer. The food you eat is stripped of its energy and that is cascaded down an energy extracting staircase – the electron transport chain – which takes the energy captured converting it into a force (the proton motive force) that helps make ATP – which is what keeps you alive and helped kickstart life. Jeremy England has calculated the entropy of self replication setting the stage to study life and natural selection through the prism of thermodynamics. Will temperature be the last force standing? It is possible that gravity, space and time may all be emergent phenomena from thermodynamics which may be the one force to rule them all.
. Erik Verlinde – arXiv:1001.0785v1 [hep-th] 6 Jan 2010. Extinction is the rule. Survival is the exception. – Carl Sagan. And all the devils are here. – William Shakespeare (The Tempest). It is best to keep one’s own state intact; to crush the enemy’s state is only second best. – Sun Tzu, The Art of War. Hundreds of years of human knowledge on H2S are nothing compared with H2S-caused life destructions and extinctions on the earth over millions of years. – Rui Wang. Gender wars, race wars, fascism vs democracy, capitalism vs communism, atheism vs theism the list of rivalries is endless.The history of the world is replete with stories of great rivalries with each side dreaming of total dominance and annihilation of the other. The reality is one of periodic, even cyclical ascent and eventual descent until inevitable attrition sets in. Let me introduce you to one more rivalry. It is ancient one, its origins buried deep in the mists of time, it is elemental, it has shaped the very nature of life and the biosphere. It may be the death of us all. Welcome to THE MOTHER OF ALL RIVALRIES. The war of the electron acceptors. There are indeed many electron acceptors,(sulphates, nitrates, even iron and manganese) but I find the story of oxygen and sulphur very intriguing. What is an electron acceptor? Lets take the food we eat – take the simplest sugar – glucose – it gets broken down from a 6 carbon structure to a 3 carbon structure Acetyl – CoA, and that is the usual fate of most of what we eat. The 3 carbon structure then further has the electrons attached to it stripped and passed down a chain called the respiratory chain or the electron transport chain. As they bounce from one molecule to another – these molecules are called electron acceptors as they have the ability to accept electrons (different molecules have differing capacities of accepting electrons) and in turn pass them onto even more potent electron acceptors. Oxygen is the terminal electron acceptor and all the energy released from this slide of electrons (and its associated energy) from food to oxygen generates a force called the proton motive force which turns the windmill of ATP synthase an enzyme (indeed a nano-machine) that makes ATP which powers virtually everything a cell (and therefore you) can accomplish. Oxygen becomes water once it has done with accepting electrons. Thats the reason we need food and oxygen. Sulphur and sulphates can also do this but produce much lesser energy than oxygen and the end product is hydrogen sulphide. The reason you can think, laugh, run, make love, build space stations is because of oxygen. We would just eke out an existence if we used sulphur as an electron acceptor. The reason is the amount of energy we get when we use oxygen as the terminal electron acceptor during the process of final combustion of food is 16 times higher than if we used sulphur. There are many bacteria that use sulphur/sulphates as the terminal electron acceptor – the anaerobes and even if you have never heard of them (Desulphovibrio, Desulphonema, Desulphobacter etc) you would have smelt them. the smell of rotten eggs, clogged drains and swamps are nothing but the smell of hydrogen sulphide. This is the end product of sulphur metabolism(H2S) just as water is the end product of oxygen metabolism (H2O). Just as we and all living things that use oxygen will die when deprived of oxygen – these bacteria will die in the presence of oxygen. They live in areas with little (hypoxic) or no (anoxic) oxygen availability like sewage, swamps and hydrothermal vents deep in the oceans. The only way they can colonise the earth is if oxygen in the air and that dissolved in water was extinguished. Thats never going to happen – you say? It may have happened many times (and may have been the cause for mass extinctions). It has been implicated in the Permian – Triassic extinction event about 250 mya an event that wiped out 92% of all species that ever lived (The Great Dying). Here is how it may have happened. Mega volcanic eruptions from Siberia spewed a lot of sulphur into the air and oceans. The bulk of sea life sequestered mainly along the shallow seas of the Panthalassa Ocean starts dying out – the increasing levels of sulphate increase the abundance of sulphur using bacteria which in turn increase H2S levels in the ocean and the air. The ozone layer was disrupted and increased UV penetration may have dealt the final blow. But wait a minute – should’nt oxygen levels ( even low levels ) have killed off the anaerobes? Turns out the story is a bit more complex – just like all good armies understand their enemy and take counter measures against their opponents strengths, the sulphur using bacteria can protect themselves against oxygen (to some extent). Indeed in some algal blooms they coexist albeit warily with oxygen producing photosynthetic cyanobacteria. They do this by a variety of ways . in D. vulgaris, they aggregate, move away from the oxygen rich zones and have an inbuilt oxygen sensor (DrcA chemosensor). The structure of this sensor is that one end of it (the N-terminal) is the sensing end and gets oxidised or reduced depending on the level of oxygen and this is conveyed to the C terminal end inside the cell – the signalling end that in turn will move the bacteria away from excess oxygen. They also have enzymes that can deal with oxygen (oxidoreductases, catalase, superoxide dismutase etc.). Make no mistake – H2S in toxic doses will kill us, Indeed it was used by the British as a chemical agent during World War 1. It does this by turning off the enzymes that help us use oxygen at the level of the cell. Yet, H2S is present in our bodies – in very small quantities compared to oxygen, they are one of 3 gasotransmitters ( along with NO and CO) that act as signalling molecules. Its imbalance has been implicated in many diseases , including diabetes, hypertension, asthma etc. It is now thought that it relaxes our small blood vessels, protects against a heart attack and Alzheimer’s disease. Possibly the greatest use of H2S may be in the future – to help us elude death – or take on interstellar travel. In 2005 it was demonstrated that H2S was able to induce a state of suspended animation in mice, this was in an animal that does not normally hibernate. Its application in resuscitation during a cardiac arrest and in acute lung injury is the matter of current research. It would be interesting to speculate that the ebb and flow of life on earth (I refer to the mass extinctions) is nothing but the consequence of alternating dominance of the sulphur breathers and the oxygen breathers each having its moment in the sun. Sure oxygen has the edge – it does produce more energetic and varied life forms, but sulphur is the understudy who occasionally (when the lead actor is ill) gets the stage and makes quite an impression although for just a few shows. One day the lead actor may take his final bow – leaving earth to the sulphur breathers. Are we, through our relentless neglect of our environment, inadvertently paving the way for a sulphurous renaissance? If it does come – we surely will perish in a sulphur hell of our own making. We always think of life not existing if we screw up the planet, but life will go on – minus us – just not as we know it. Wang R. Physiological Implications of Hydrogen Sulfide: A Whiff Exploration That Blossomed. Physiol Rev 92: 791–896, 2012; doi:10.1152/physrev.00017.2011. Language is the most important evolutionary invention of the last few million years. Natural selection can only see the advantages of syntactic communication if the size of the system is above a critical value. – Martin Nowak. As I write this post the European Space agency is attempting to land a probe on a comet. This easily ranks as one of mankind’s greatest achievements to date. It would not have been possible if our ancestors had not discovered the use of words. Language has transformed humans and in turn the planet. It has set us distinctly apart for our closest cousins the apes. Some biologists rank the evolution of language skills on par with the formation of RNA, the first cells and the evolution of multicellular life. Language makes communication, effective, is unparalleled as a form of passing on survival advantages from generation to generation without the help of genes . In short it is the reason for civilisation. without it we would be no better off today than our hominid ancestors. How could noises in the throat, grunts etc have evolved into the complexity of present day language? Language is a trait that needs many different things to have happened. The vocal cords and associated muscles, the palate, the upper aero-digestive tract (pharynx and larynx ), the tongue etc. had to change in structure and orientation to each other. The brain had to develop a neural circuitry to both create and understand language.Language is a biological creation and as such it obeys the laws of biology. It evolves, it can flourish, it can mutate and it can go extinct just like any species. There was a time when our ancestors could not speak and then they could – what happened? If you trace our ancestry after we split from a common ancestor with the chimpanzee, what we do know from the fossil record is a non linear trajectory to us through Australopithecus (2-5million years ago: brain volume – appx 400cc), Homo habilis, Homo erectus (about 1-2million years ago: brain volume appx 600cc) and then Neanderthals alongside early Homo sapiens (brain volume 1200-1500cc). The fossil record has been studied for what has been called the supralaryngeal airway configuration. this is a description of the physical structure of the space in the throat that is important for voice production. the standard plan – that is the basic configuration in monkeys, apes etc and the human version. The next time you drink something quickly or eat in a hurry and feel a choking sensation and start coughing remember its a small price to pay for human civilisation – thats right I am not exaggerating. The mouth, tongue, palate, nostrils, the epiglottis, the larynx (voice box) with its vocal cords and the pharynx together help you breathe and swallow food and drink. They are the composite organ for voice production as well. The larynx is high up in the throat in all apes and indeed in new born human babies. This helps the epiglottis approximate the soft palate and ensures a patent airway is formed to deliver air to the trachea and lungs even when the animal is drinking. The fluid tracks from the mouth to the sides of the larynx and into the pharynx and the upper gullet (oesophagus). Hence apes are obligate nose breathers. They can continue breathing even while feeding. This is also the case with new born human babies – as they suckle they can continue to breathe – if they could not they would get breathless after small feeds or choke every time they fed – NOT a useful survival strategy. In human children the larynx descends lower down and the posterior 1/3rd of the tongue also is in the upper throat by about 2 years of age. Many aspects of the upper aero-digestive tract have been studied and quantified in hominid fossils and apes. One remarkable measurement is called the basicranial line. It is an imaginary line drawn from the tip of the nasal bone through the palate to the base of the skull. It denotes the angle the base of the skull makes with upper airway. Only adult humans among the primates have an angle of 125 degrees. This angle is much less flexed about 134-137 degrees in all primates and early hominids and indeed in new born babies. This is as a consequence of descent of the pharynx and the new origin of the muscles of the pharynx. The ability of apes to approximate their ‘voice box’ to the back end of the nose – although excellent for drinking and breathing and swallowing without fear of choking – is not conducive for producing vowel sound that are so central to language. Talk is not cheap. it comes at a price. The average vocabulary of some like you reading this post is about 50,000 words. it is estimated that until the age of 16 we learn a new word every one and half hours that we are awake. words are sounds strung together, sentences are words strung together. The agreed upon sequence of words in a sentence is the syntax and grammar of a language. It appears that newborns get about 90% of the grammar right from the word go – it appears innate rather than taught.The voice box is just a tool to produce the sounds, language is more than that. It is intricately connected to learning, memory and even emotions. So the real action is happening in the brain. The eyes have captured the light reflected off the object and they have relayed a signal to the visual centres of the brain, these in turn send the impulses to a part of your temporal lobe called Wernickes area (area 22) which tries to understand the visual image it has received and then relays this information (via a band of neurone called the arcuate fasciculus) to another region of the brain in the frontal lobe called Brocas area (area 44). This area co-ordinates and prepares to vocalise this information. It in turn coordinates with the motor cortex and makes your vocal cord, tongue, lips etc move and vibrate the air to produce a collection of sound waves which are heard as the word. It is fascinating fact that when you learn a second language as a child both languages are represented in a single area in the brain whereas when you learn a second language as an adult it is represented as a separate albeit adjacent area of the brain. Many linguists believe there is an underlying grammar and syntax that is common to all languages. That is there was descent and modification, reflecting local needs that led to the plethora of languages. If that is true then much like life has a as yet hypothetical Last Universal Common Ancestor (LUCA), there may well be a common first language to all mankind now lost in the mists of time. These areas of the brain can get damaged (from a stroke or head injury) and produce disorders of language. The disorders are called aphasias. There are many forms – damage to the Brocas area can lead to a person having very few ( rarely only the last words uttered at the time of injury) words at their disposal to describe everything. This is called non-fluent aphasia. Damage to the Wernickes area – can sometimes make the person talk a lot, but they may speak gibberish indeed invent new words (neologisms) that have no meaning. This is called fluent aphasia. Usually strokes or trauma leads to extensive damage and both understanding(receptive) and communication (expressive) aspects of language are lost. Sometimes when deaf people have damage to language areas they lose the ability to communicate via sign language. Animals communicate via sounds that convey whole events , e.g a monkey call for snake on the ground, or tiger nearby. This is non syntactic communication. Words on the other hand can be strung into almost limitless combinations (sentences) to convey any number of things – this is syntactical communication of humans – this represented (according to some biologists) a survival advantage that made up for inherent physical weakness over other animals and maybe even Neanderthals. Jablonka et al. have argued that there has been a coevolution of emotions and language. The most basic ‘fight or flee’ response is usually set in motion by disturbances in the herd, danger calls or visual sighting of the predator. But if a tribe is on the move and is told that there is a tiger that lives about 4 miles away – a flight response at that second becomes meaningless. This in turn leads to inhibition of the fear response or a more complex modulation of it. This may in turn have helped us evolve complex and new emotions – defining us as human. Words help us share experiences creating increased empathy, words can alter reality, true and false as a concept is enhanced by language – i.e. what was said and what was seen are different. They can stimulate our imagination for things which we or indeed no one else has experienced. It in a word elevates us above the mundane. Words introduced humans to humour. Dialogue meant not every aggression needed to end in a bloodbath. Abstract concepts can be conveyed by words as well as love, fear and happiness. Words, like the people that use them are born, live and die . The advent of writing immortalised words, transmitted knowledge wholesale (unlike genes that could transmit to only the next generation) to succeeding generations, indeed all mankind. The collective strength of humanity went up manifold. The result is everything you see before you today – if it was not for words we may still be in the Stone age. Martin Nowak has described the mathematical models that describe the principles of language evolution. 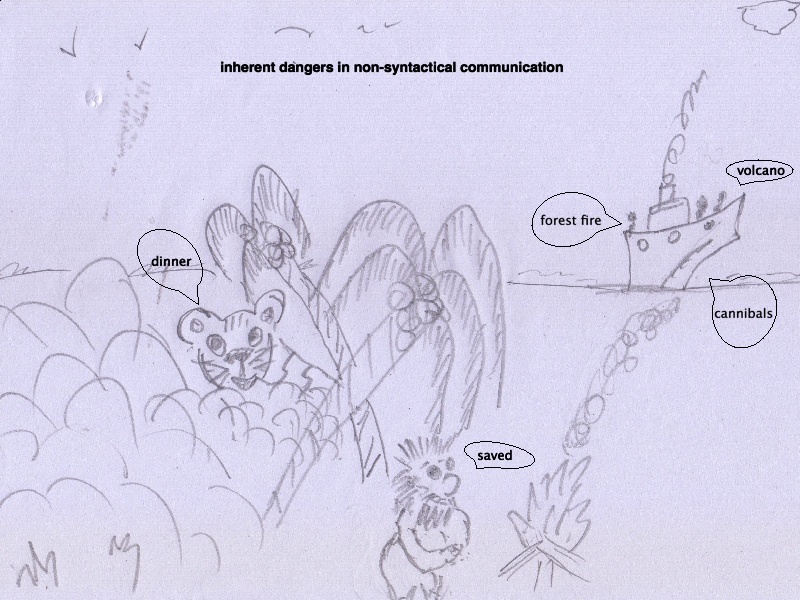 He asserts that for syntactical communication there is a threshold population size necessary beyond which natural selection will favour rapid language development. The Information technology revolution is in a sense the rapid transmission of language in all forms thus enhancing its value. Words hold the key to our future. To paraphrase the Bard (whose mastery over words is unparalleled) to describe the beauty of language. Therefore it is true to say that though humans made language it is language that made us truly human. Nowak MA. Evolutionary biology of language. Phil. Trans. R. Soc. Lond. B (2000) 355, 1615-1622. Chapter 12, 1994. Harvard University Press. Jablonka et al. The Co-evolution of language and emotions. Everything has to start from somewhere. Indeed life is about harnessing energy and making complex molecules out of simple ones . The complex molecules have properties that carry out different functions. The evolution of life is in one sense the evolution of molecules and their complexity and stability. Stars spew out many elements – interstellar space, comets contain a variety of molecules, however to get from these simple molecules to complex organic molecules and then life appears a stretch. Our sun radiates an enormous amount of energy – this is lost in the cold of space. earth has managed to capture some of the energy and sequester it to perform the magic of life. Electric discharges, ferridoxin (the iron-sulfur world), UV light are some of the contenders as to the energy source. Let us consider only UV light in this post. 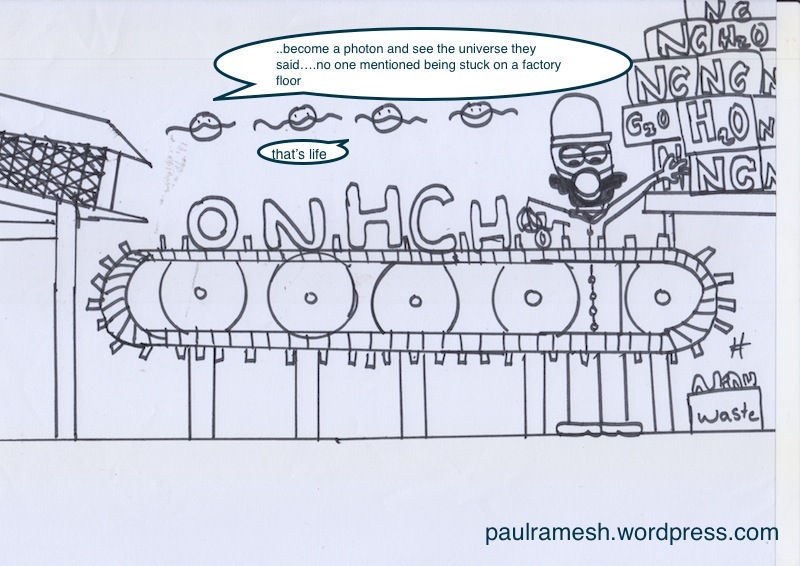 We had seen (please see blog on light /https://paulramesh.wordpress.com/2014/02/ that different wavelengths of light have different energy – the shorter the wavelength, the higher the frequency the greater the energy. Early earth (about 4 billion years ago) had not much of an atmosphere to speak of, UV light penetration was much higher than today. When a photon with an energy level that is just right to excite an electron to a higher orbit came along the electronic configuration of that molecule or element changed and the possibility of newer molecules being created increased. But which molecule and why? There are a few molecules in contention, but foremost among them is formamide (CH3NO). it can be synthesised from carbon monoxide and ammonia (themselves found throughout universe). Formamide has been identified in comets. Whether the original formamide that kickstarted life was from outer space or made here on earth, it has certain features that make it a prime contender for the title precursor molecule of life. It is one of the simplest molecules to have a peptide bond. This is a bond between the Carbon and Nitogen parts of the molecule and is a hallmark of molecules called amino acids that form proteins and hence life. NO PEPTIDE BOND, NO AMINO ACID , NO LIFE AS WE KNOW IT. Formamide has been studied in great detail. It can be joined up in series to give more complex molecules including nucleic acids the forerunners of RNA and DNA. Just heating them up can lead to complexity, but some of the reactions can take very long or use a lot of energy. One method by which the process could be kickstarted easily and maintained is photocatalysis. indeed heat with UV irradiation yielded both different kinds and increasing quantity of nucleobases (eg. adenine, guanine, hypoxanthine , etc.). Even with an energy source as powerful as UV light – organic chemical reactions can be notoriously slow. the presence on earth of materials (transition metal oxides eg. titanium dioxide) would facilitate the transfer of energy from UV to the reactants such as formamide. The energy provided by the combination of UV light and photocatalysts was a sustainable source of energy that molecules like formamide used to string themselves into more and more complex polymers. The molecules that were most stable survived and more of them accrued – this also accounts for the fact that very few types of molecules are at the basis of all life. It can be concentrated quite easily by evaporation. It has been flagged up as a potential alternative to water for extra-terrestrial life forms. Just starting out with formamide ( or even with carbon monoxide, ammonia, water and hydrogen cyanide) with a few transition metal photocatalyst and a planet surface with incident UV light brings us quite quickly to all the molecules required for life. Photocatalysis is also the mechanism that is being increasing investigated to help produce clean fuel in the form of hydrogen from water. The oldest mechanism that may have helped start life may well be the solution to one of the biggest current problems on earth. 1. Martin WF et al. Hydrogen, metals, bifurcating electrons, and proton gradients: The early evolution of biological energy conservation. 2. Saldino R et al. From the one-carbon amide formamide to RNA all the steps are prebiotically possible. 3. Senanayake SD et al. Photocatalysis and the origin of life: Synthesis of nucleoside bases from formamide on TiO2(001) single surfaces. 4. Jones BM, Mechanistical studies on the production of Formamide (H2NCHO) within interstellar ice analogs. 5. Barks HL et al. Guanine, Adenine, and Hypoxanthine Production in UV-Irradiated Formamide Solutions: Relaxation of the Requirements for Prebiotic Purine Nucleobase Formation. Like all walls it was ambiguous, two faced. What was inside it and what was outside it depended upon which side you were on. 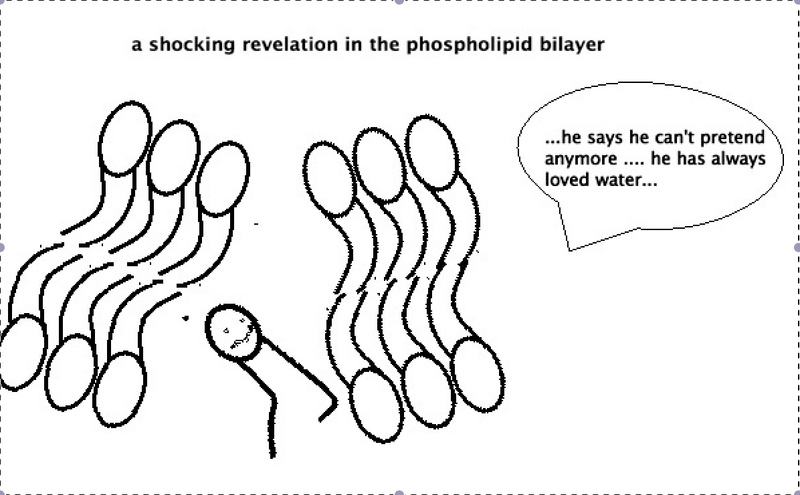 Without the lipid bilayer we would have no physical shape. In fact, we would be little more than a puddle of chemicals on the floor. In probably one of the most important divisions between oneself and the other is the definition of the cell and its external environment. The physical structure that makes this distinction is the cell membrane. How does the cell membrane divide the inside of the cell from the outside? 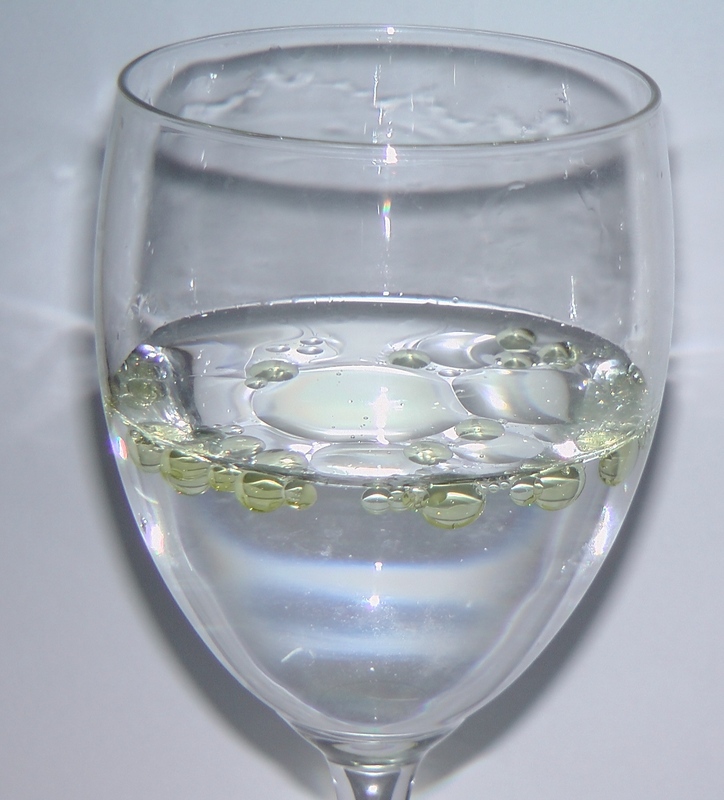 Our bodies and our cells are effectively made up mostly of water. The most likely place for the origin of life is an aqueous environment. At its most basic structure the cell membrane is described as a lipid bilayer. The organic molecule that constitutes the cell membrane is called glycerophospholipid. It has a carbohydrate part called glycerol, a fatty acids part and a phosphate and protein part. The phosphate part is polar in nature. This means that it interacts well with water, which in turn means that it forms hydrogen bonds with water. This part of the molecule is called hydrophilic which means water loving. The fatty acid part is set to be non polar in nature. This means it does not interact with water to form hydrogen bonds and indeed leads to disruption of the hydrogen bonds that exist between water molecules. In order to preserve stability of molecule and water, the the water loving part orients away from the water hating part. The molecule in effect folds and aligns in such a way that the water loving part faces the water (the hydrophilic head) and the water hating part lies together away from the water (the hydrophobic tail). This is also the reason why oil and water do not mix. The primary function of the plasma membrane is similar to a border security force. It regulates what can get into the cell, and how much of it, what can get out of the cell. It is a dynamic and complex structure – not just a barrier.Cholesterol – which has over the years gained a bad reputation in health matters – is an integral part of the membrane – indeed it is vital for its function and is found inserted between the lipid bilayer. The cell membrane is a very fluid structure and is far more than just a bilayer and cholesterol. There are protein structures that traverse its length – the integral proteins, they were thought to move like icebergs in a lipid sea. it is now believed that the movement is not random but goal directed. Molecules can pass into and out of a cell in a variety of ingenious ways. Simple diffusion – certain small uncharged molecules have a green channel and can just go across the membrane provided their concentrations inside the cell are lower. Some have to be transported across the membrane via carrier proteins, the molecule gets onto a defined integral protein that changes shape and carries it to the inside of the cell. If this process requires energy – it is called active transport such as for hydrogen ions as they have to be carried against their concentration gradient , if no energy is required e.g.. Glucose it called passive transport. Ion selective channels – here the protein is specific for the ion that it will transport into the cell, it is controlled by electric potential (voltage gated), chemical transmitters (ligand-gated), mechanical stress (mechanical gated e.g. in the ear) and light see blog on light. The integral proteins can be receptors for hormones – so the arrival of a hormone can induce changes in the receptor and trigger changes on the inside of a cell and thus control its function. They also link the internal scaffold of the cell (the cytoskeleton) to the external scaffold ( the extracellular matrix). 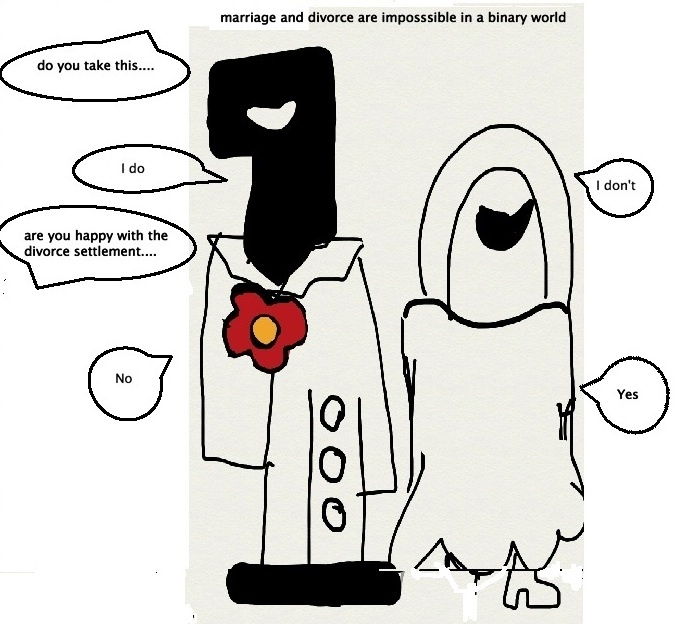 the complexities of this relationship are only now being studied in detail. Molecules can be transported inside by the cell membrane just engulfing and ingesting them – endocytosis. this happens to bacteria when they are attacked by your immune cells. The membrane has other functions to anchor the cell to the next cell, to the scaffold and move it around when necessary. One of the essential difference between bacteria and us is in the way the cell membrane is configured. The bacterial cell wall endows it with a capacity to sometimes evade our surveillance, be harmful to us and indeed one of our weapons ( an increasingly obsolete one ) is to target the destruction of the bacterial cell wall with chemicals ( antibiotics). The breakdown of the defences of our barriers especially in the intestine against our most ancient foe (and friend) leads to one of the most catastrophic clinical situations known to medicine – the sepsis syndrome (later in detail). What dose base 2 mean? We are familiar with using numbers from 1-9 (base 10 system) – no doubt because we can relate to it as it is the same as the number of fingers we posses. Just as we have no new number to represent anything beyond 9. We represent 10 by reverting to putting 0 in the ones place and 1 in the tens place. 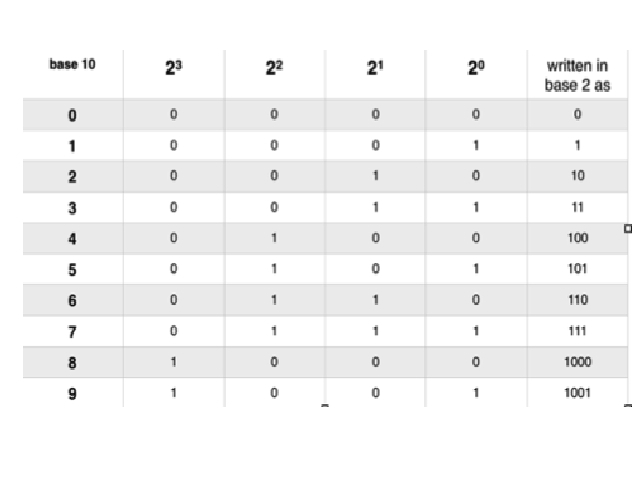 Another way of describing the base 10 system is to say – units as 10 to the power 0, tens as 10 to the power 1, and hundreds as 10 to the power 3. Solid geometrical shapes can be represented using the binary system. Here is an example of representing a cube using the 1’s and 0’s. 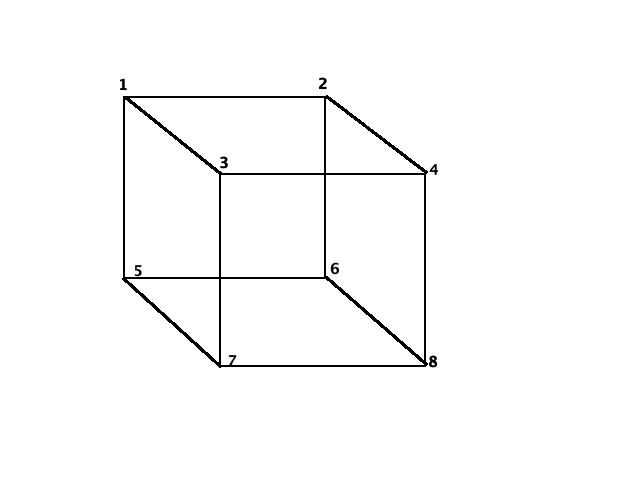 Take a cube and designate its corners as numbers 1-8. The numbers are a mathematical representation of a cube*. Any event, signalling, cell death etc can in theory be regressed to a series of happens and does not happen and complex mathematical models can be made to study and understand them better. this is the field of binary biology and is being used among other areas in cancer biology to predict the behaviour of cancers and treatment outcomes.